The last Sunday of July is always the Adventure Radio Society's Flight of the Bumble Bees contest. 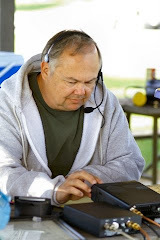 It's a four hour, low key QRP event that encourages people to head to the outdoors for an afternoon of fun operating. I was only able to operate for a little over an hour and logged just two contacts. The propagation really stunk here today.Still, it's an enjoyable event that I particularly like because most of the ops call CQ at reasonable speeds that mere CW mortals can copy. Highly recommended for your calendar in 2010!